Well,although we bring together free font collections time to time we decided to share a free font everyday and today’s free font Sant’Elia is designed by Yellow Design Studio. Sant’Elia Script from Yellow Design Studio is a robust modern type family with regular and rough versions in six weights. Its letterforms are crisp and welcoming with a splash of verve. Alternate versions feature angled strokes that inject extra energy. 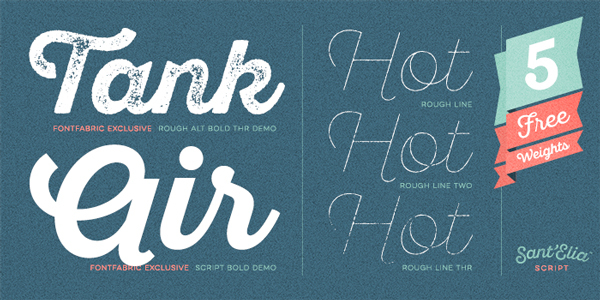 Rough weights include three different distress levels that can be mixed for added control and customization.Five (5) fonts – Rough Line (3 weights), Script Bold & Rough Alt Bold are available as free fonts.